IRISH PARTY IN THE PARK KICKOFF EVENT ON MARCH 9! Featuring Live Music, Dancing, Bagpipes, and the World’s Tallest Leprechaun! Get ready for the best Irish Happy Hour in town as the Fort Lauderdale St. Patrick’s Parade and Festival kicks off with an “Irish Party in Park” on Friday, March 9 from 4 – 7 pm at Huizenga Plaza, located at the corner of Las Olas Boulevard and Andrews Avenue in downtown. 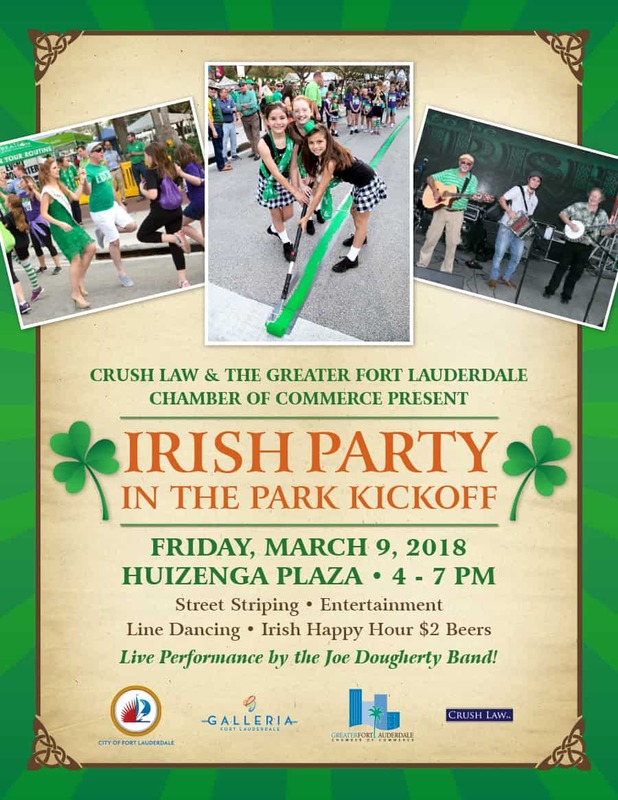 Presented by Crush Law and the Greater Fort Lauderdale Chamber of Commerce, this free event will feature an Irish Happy Hour, a live performance by the Joe Dougherty Band, the legendary striping of the street by Parade Grand Marshal and Fort Lauderdale Mayor John P. “Jack” Seiler, participatory line dancing, the World’s Tallest Leprechaun, and more! Plus $2 beers for everyone wearing green! See you in the park on March 9!